All around us, people are getting rid of their material possessions and actively concerning themselves with reducing their carbon footprints. Think about the shows and articles on tiny houses and downsizing – it’s almost the complete opposite of Keeping Up With the Kardashians! Whatever is motivating the current craze of decluttering and simplifying, product fundraisers are taking note. 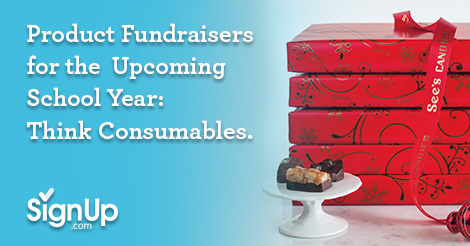 The big word in product fundraising for the upcoming school year is CONSUMABLES. Chocolate: Specifically See’s Candies chocolate. It’s not just the idea of selling chocolate—a product that practically sells itself—but it’s the idea of selling chocolate of such surpassing quality that everyone’s eyes light up at the thought! For decades, See’s Candies has been partnering with schools and non-profit organizations, providing them with an excellent, American-made delicious product to sell and the (live human!) support needed to do so, AND allowing them to keep up to 50% of the profits, See’s has become the perfect vehicle for fundraising for good causes. Especially at the holidays, people will not just buy one item from a fundraiser, they stock up and give See’s to everyone on their list. See’s offers flexibility with several different ways in which to sell, and can be combined with event fundraisers such a movie nights, choir and band concerts, sporting events, theatrical productions, etc., to maximize fundraising. Click here to find out more about the fundraising offers. Bath products: Artisanal soaps, bath salts and scrubs are more good choices for luxurious consumables that make good gifts and won’t add to your buyers’ clutter issues. Choose from many lines of products but remember to carefully examine the profit share - not all companies/products are the same! Candles: While candles have long been included in the product fundraising lexicon, there are new products on the market that keep this category fresh and attractive. There are candles that combine aromatherapy and allergen-free wax for a healing experience and the new-fangled “crackle” candles - candles that sound like a tiny fire in the fireplace - are all the rage. Coffee and tea: For a smaller fundraiser, or one to run in conjunction with another product, consider selling coffee and tea. While it has less of a broad appeal, it’s a nice offering for sleep-deprived parents! Paper products: Gift wrap sales are a perennial fundraiser, with a small caution that you can’t run this one too many years in a row because people tend to stock up initially and then stop buying. Sell along with stationery, notepads and cards for added variety and success. There are a lot of factors to consider when it comes to picking the right product for your school’s fundraising campaign, but you can’t go wrong if you choose your product based on the end user first. Paying attention to the current trends among your buyers will help focus your products on the end-user, which is a recipe for success every time!